Before the 2014 was over there was a report saying that Samsung would be releasing a new smartphone in their country at least and that's going to be early this year. True enough Samsung just did that as the Korean electronics company has officially announced the Samsung Galaxy Grand Max in South Korea. It's not much of a smartphone though and most of its specs fall under mid-range category so there is actually almost nothing to be jealous about this device being only available in that part of the Korean country. Who knows maybe Samsung is also planning to release this outside of their country sometime this year. 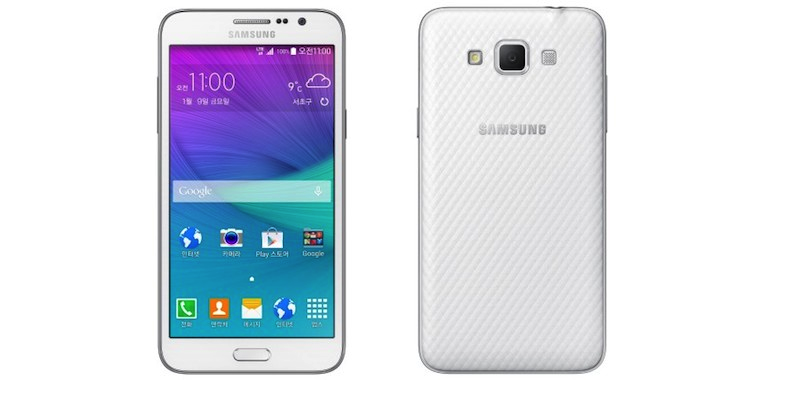 So what are the features and specs found on the Galaxy Grand Max phablet? First it sports a 5.25-inch HD display with IPS LCD panel. That means the device has a 1280x720 pixel resolution across its big screen with a total of 282 pixels per inch. Powering the Grand Max is a 1.2GHz quad-core Snapdragon 410 processor from Qualcomm and a 1.5GB worth of RAM. Internal storage, users get 16GB right out of the box which is expandable via microSD card up to 64GB. On the back sits a 13MP camera with autofocus and LED flash paired with a front-facing one at 5MP equipped with up to 120-degree wide angle lens, so selfie pics can have a wider background. Sad to say the Galaxy Grand Max only runs Android 4.4.2 Kitkat OS instead of the most latest one which is the Android 5.0 Lollipop, or perhaps an update will follow after the release. See more specs below. Right now the Samsung Galaxy Grand Max is already available in South Korea for KWR 319,000 or about Php13k in the Philippine currency. If ever the device will be released in the country, I will let you guys know.